In my last post, I gave you a suggested circuit through eastern Brittany. This time, we’ll cover western Brittany, where you’ll encounter wild, rocky coastlines, lush pastureland, and unforgettable villages. 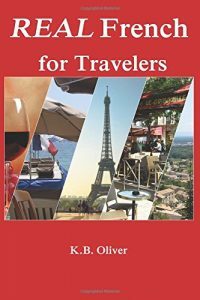 If you’re starting off in Paris, think about renting a car in St. Brieuc to return in Vannes or Lorient (to the south at the end of your circuit.) This will save a few hours of drive time from Paris to Brittany. That way you’ll focus on your experiences instead of the travel itself. St. Brieuc. We’ll start our tour in St. Brieuc, a mid-sized town on the north coast which sits between two rivers. Rivers also run through the town and there are dozens of bridges. 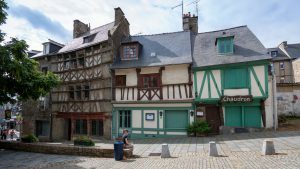 Its half-timbered buildings, common in Brittany, lend a medieval charm to this lively town, especially in the Old Town. Place du Martray is the main spot, and includes a covered market. In summer on Thursday and Friday nights, enjoy free concerts of all types of music. The 13th-century St. Brieuc cathedral looks a bit more like a fortress than a church, with fortified towers. 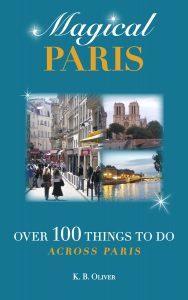 Along with that are sleepy beaches and ports and the nearby Zooparc de Trégomeur. Better beaches aren’t far away, in Pléneuf-Val-André to the east and Binic to the west. Paimpol. As you head up the coast to the west you can’t miss Paimpol, which was historically known for cod fishing. It’s a picturesque town built around the harbor and the historic old town. In Old Town, there’s a weekly Tuesday market, 15th-century houses, and cobbled streets. Between May and September, you can take a century-old steam train (le Vapeur de Trieux) between Paimpol and Pontrieux along the Trieux River. Cote de Granit Rose. Next, you’ll encounter the Pink Granite Coast (see Hidden Beaches of Brittany post for more details). Discover its calm beaches and charming fishing villages. You’ll also find the small resort town of Perros-Guirec with a lot to do but away from the crowds of the Mediterranean beaches. Morlaix. 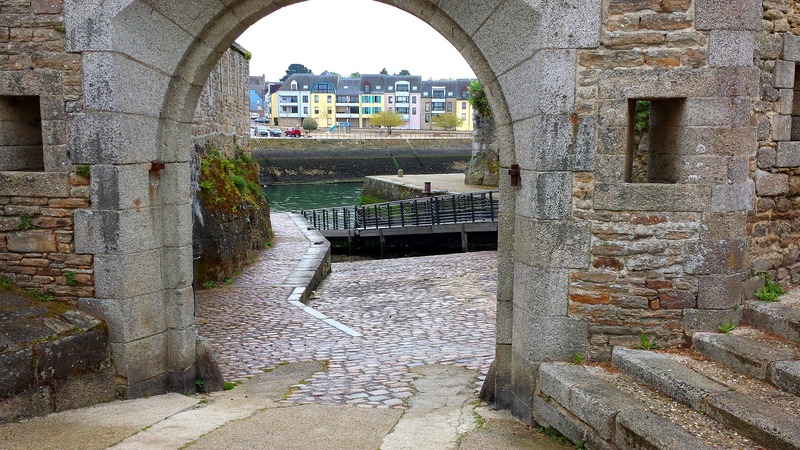 Southwest of the Pink Granite Coast is the town of Morlaix, popular for water sports and nature walks along the inlet. It also has a medieval Old Town with museums and 16th-century buildings and a 19th-century viaduct dominates the town. 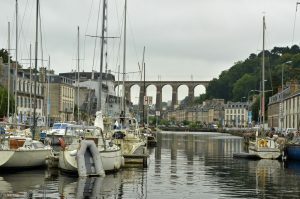 At one time Morlaix was the third largest town in Brittany. This is another option for train access from Paris if you’d like to end up deeper into Brittany before renting a car. Brest. The main interest of this large naval city in the extreme west of France is its aquarium, Oceanopolis, one of the best in France. Most of the old town was destroyed in the second World War. Don’t make a detour unless you’re headed for the aquarium. Pointe du Raz. 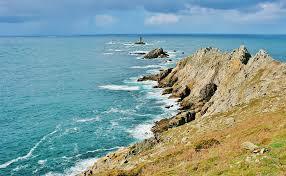 This rocky coast with surprising savage beauty is the westernmost point of France. Here you won’t find beaches, but you will experience incredible beauty, coastal strolls, and lighthouses. Quimper. Quimper has existed since Roman times and is traditionally Breton in culture. Rivers covered by foot-bridges cross the town, which is filled with historic buildings. Here is also where you’ll find Quimper Faience, traditional pottery made since the 17th century. It lies at the confluence of the rivers Steir, Jet, and Odet. Concarneau. This walled town on the southern coast of Brittany has the distinction of being the third most important fishing port in France, especially for tuna. Tourists can observe fish auctions, take fishing boat trips, or visit the fishing museum. Walk around the Old Town and visit the restaurants and shops or walk on the ramparts or on one of the beach paths. In August is the Festival des Filets Bleus, a fish-centered festivity with music, seafood, and fun. 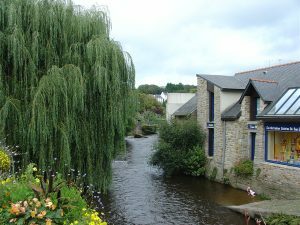 Pont-Aven is a small jewel you encounter as you drive back east along the southern coast of the Brittany peninsula. The River Aven is an important part of the town, and its 4 waterwheels provide the music of flowing water. Everywhere you look is picturesque. That may be why a group of impressionist painters including Paul Gauguin settled here in an artist colony. Here you can see the cross that Gauguin reproduced in his famous Yellow Christ painting. Lorient is the town that winds up our circuit. It was once the headquarters of the French East India company. Much of the old town was destroyed in World War II, but there is still a charming town to visit. Each year during the first week of August, the Inter-Celtic Festival is held, when the town comes alive with music and Celtic culture. Reserve ahead if you’ll be traveling during the 10-day festival. That wraps up our two circuits of Brittany, both east and west. Of course, there is much more to see than this, but these will get you started! Brittany, Concarneau, Cote de Granit Rose, Lorient, Morlaix, Pointe du Raz, Pont-Aven, Quimper, St. Brieuc. Bookmark. This is just what I’ll be needing when I plan my next trip to France. Thanks! That’s great, Linda! I hope it’s helpful for your planning!